Shiny Pretty Things: I ruddy well won something!! I ruddy well won something!! I'm not what one would call one of life's winners, don't get me wrong, I've achieved and I've achieved highly, but I haven't won - sports day, definitely not my thing, raffle prizes also allude me, as do lucky dips and competitions. But my luck has changed, and okay I have won the item that holds the least monetary value of anything I've ever entered but I don't care, I did a squeal of excitement both when I found out and when my prize was delivered today!! I also know that other people won as well but I simply do not care!! ...But I did... and now all my Real Techniques brushes have their own special home, which, for someone like me who likes everything in it's rightful place, is perfect. 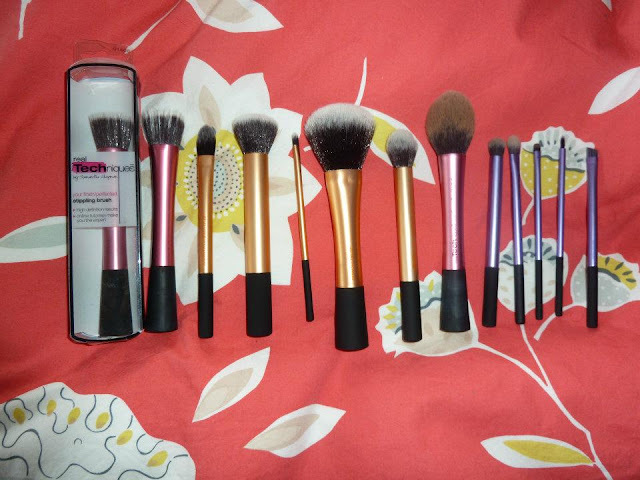 Click here for my review of the Stippling Brush! More reviews coming soon! Oops I went to MAC. Make Do and Mend - Revamped Nail of the Day!